Sticky rice or glutinous rice are very common in Asian cuisines. The rice was grinded into flour to make varieties of cakes and sweets.. Chinese have cakes that made from glutinous rice flour like Hainanese E-bua, tortoise longevity cake, tang yuans and etc. ; Malay have kuih koci, ondeh ondeh etc. 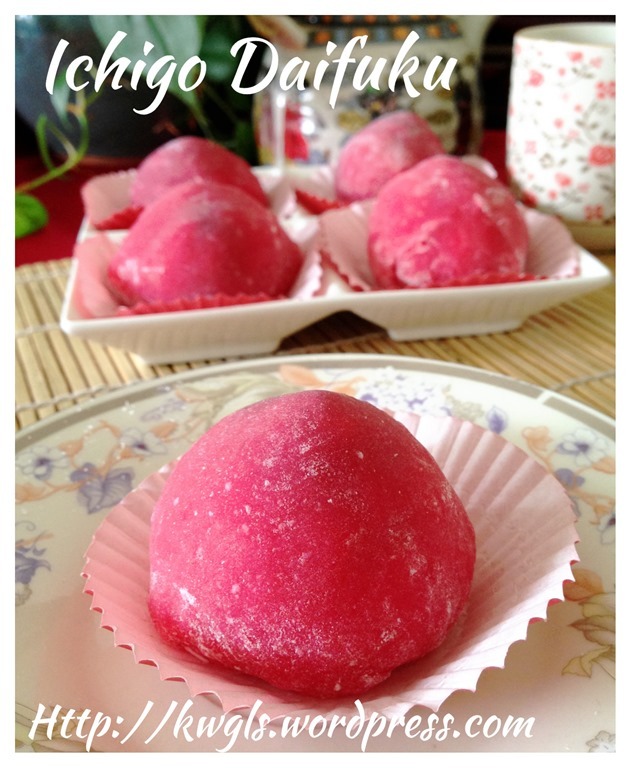 and Japanese have its own mochi. All these cakes have one common similarity. 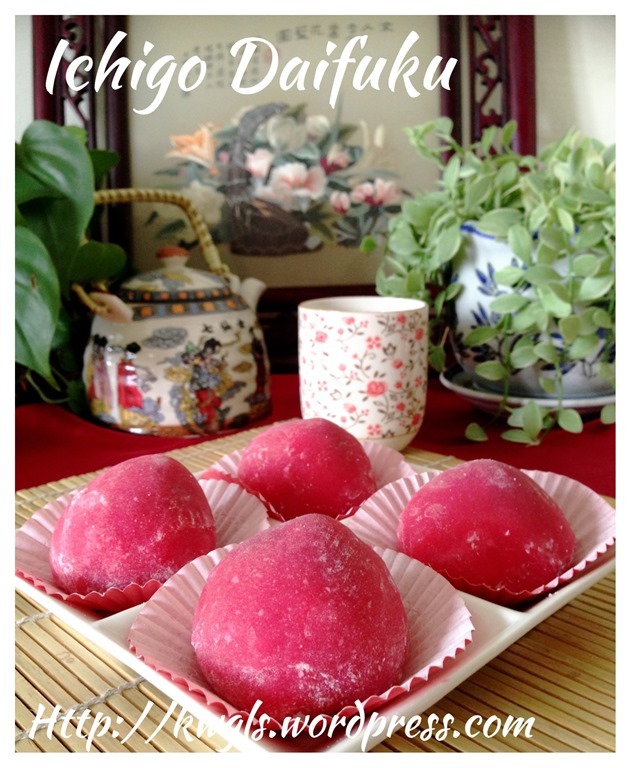 Some sweet filling wrapped with glutinous rice flour dough. 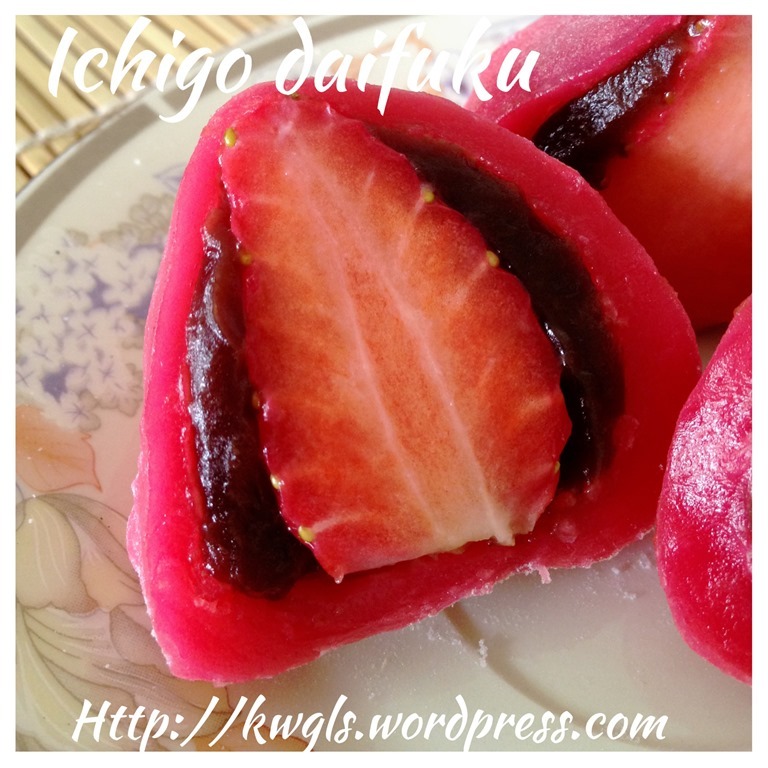 I have always liked mochi as it is soft sweet and slightly chewy. 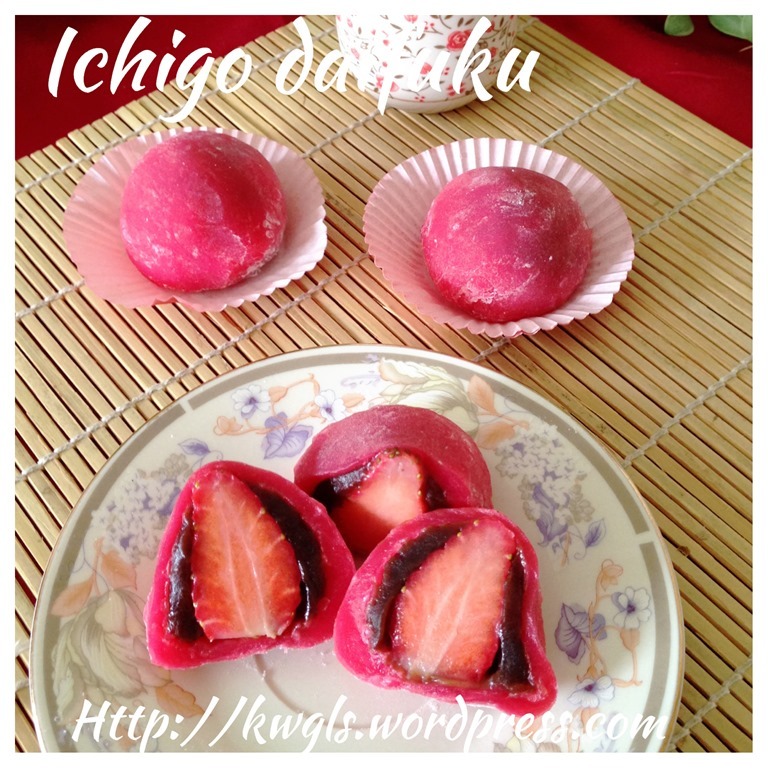 What i am sharing today is the Ichigo Daifuku, some strawberry wrapped with red bean paste and glutinous rice flour dough. 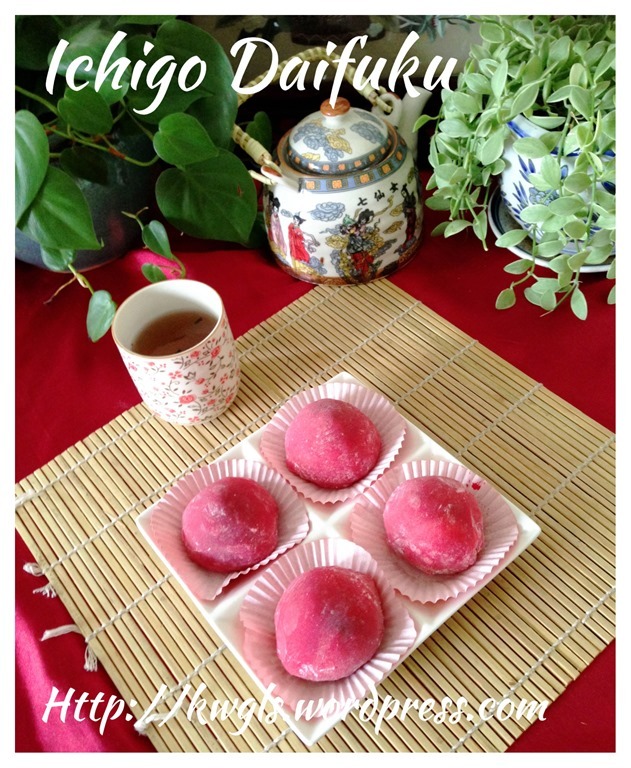 For this illustration , I did not go until the extent of preparing my anko (red bean paste) using the Japanese method but instead use the ready made red bean paste available in the stores. 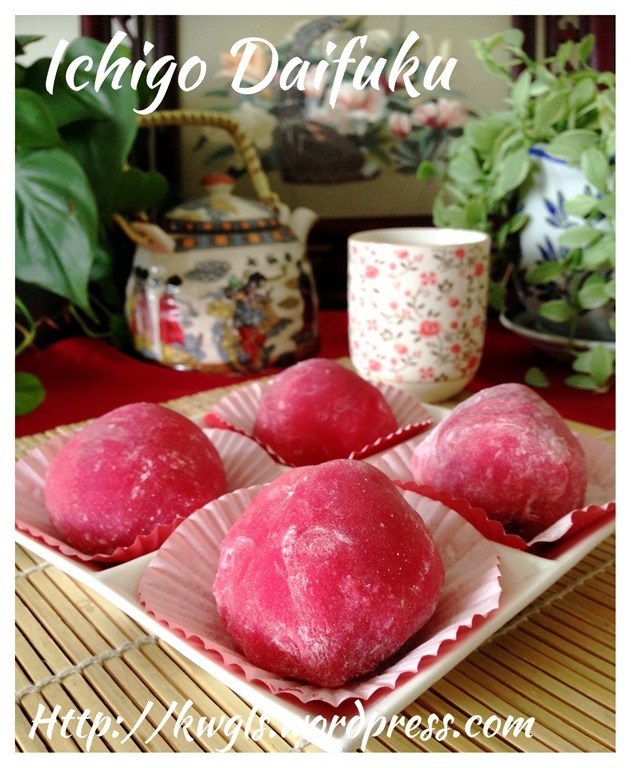 I also did not go to the Japanese supermarket to by the Japanese glutinous rice flour (mochiko), instead, I used the normal glutinous rice flour from Thailand.. Preparation is not difficult at all if you are using microwave. If you do not have the microwave, you can either steam the batter or cooked it in a non stick pan until a soft dough is formed.. Don’t worry, the outcome will be the same. Clean the strawberry, pat dry and cut off the part attached to the green leaves. 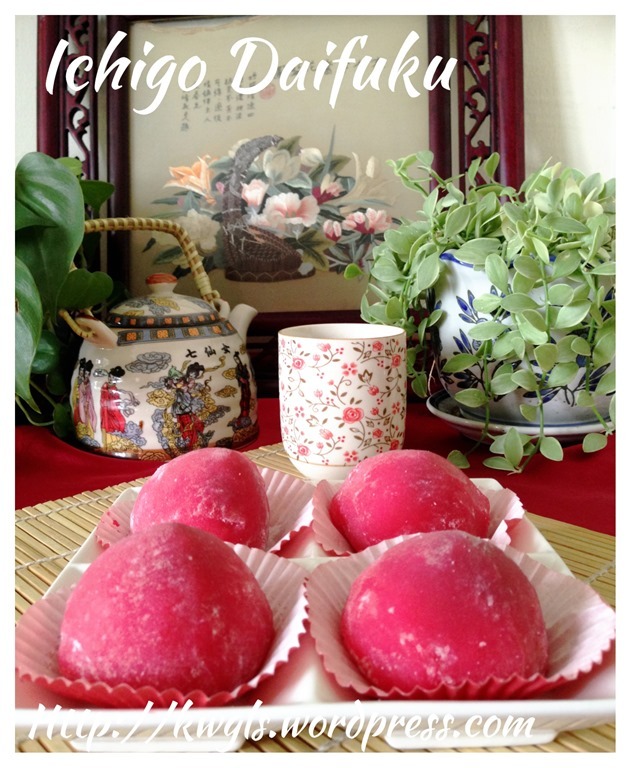 Take about 20 grams of red bean paste, shape round, slightly flatten by palm, place a strawberry on top, seal the edges and make it as round as possible. Set aside for later use. 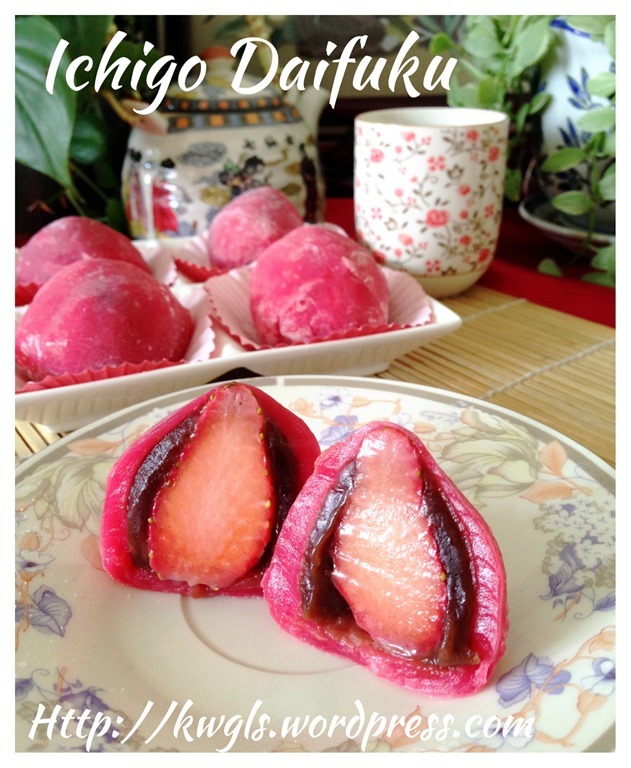 If your strawberry is big, you may need a bit more red bean paste to wrap the strawberry. 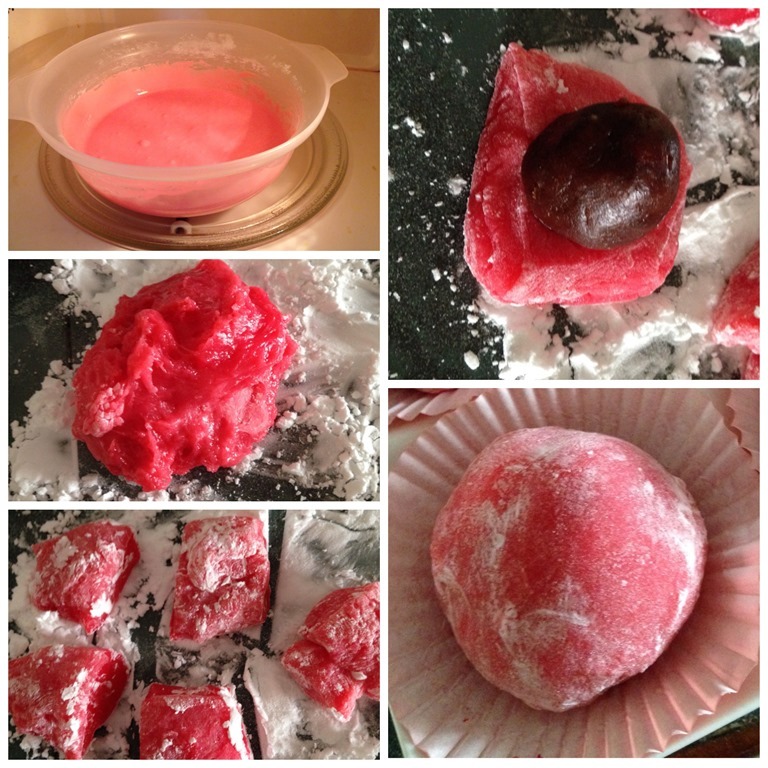 In a microwavable bowl, put the glutinous rice flour, water, sugar and food colouring. Stir and until well mixed. Heat the batter in the microwave oven for 1.5-2 minutes. After one minute, give it a stir. Dust the working surface with some potato starch. 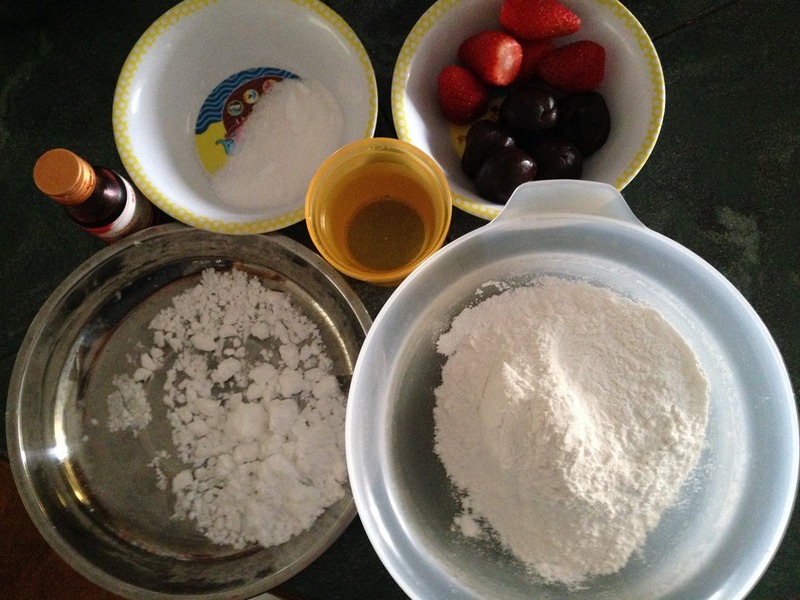 Transfer the cooked dough to the flour surface. Use a scissor to divide the dough into 5 pieces. 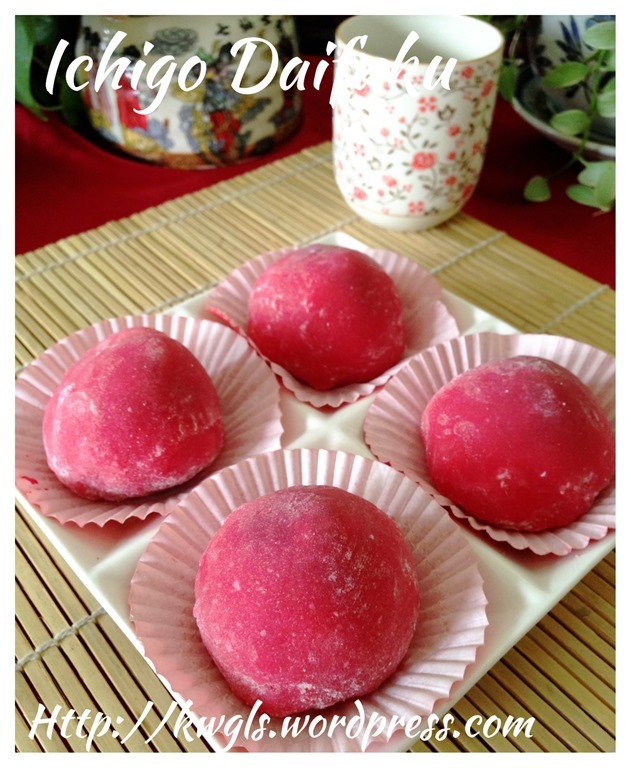 Take one dough, shape round, lightly flatten, put a red bean paste on top of the flatten dough, seal the edges and roll on the potatoes starch again.. The dough can be rather sticky and hot to handle but you have to do it quickly. 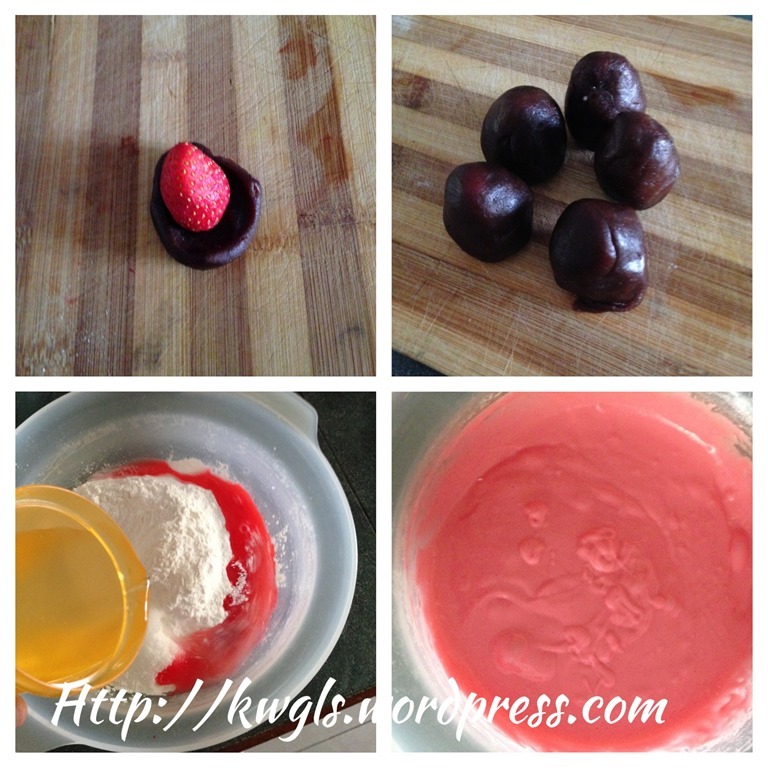 When the dough is cooled, it will not be sticky and cannot form a ball. Pat your hand with potatoes starch before shaping. Is it not this is a simple recipe to try? Remember that if you do not have a microwave, pan fried the batter over the stove using non stick pan or steamed it in a greased pan. It may take you 5-10 minutes slightly longer. 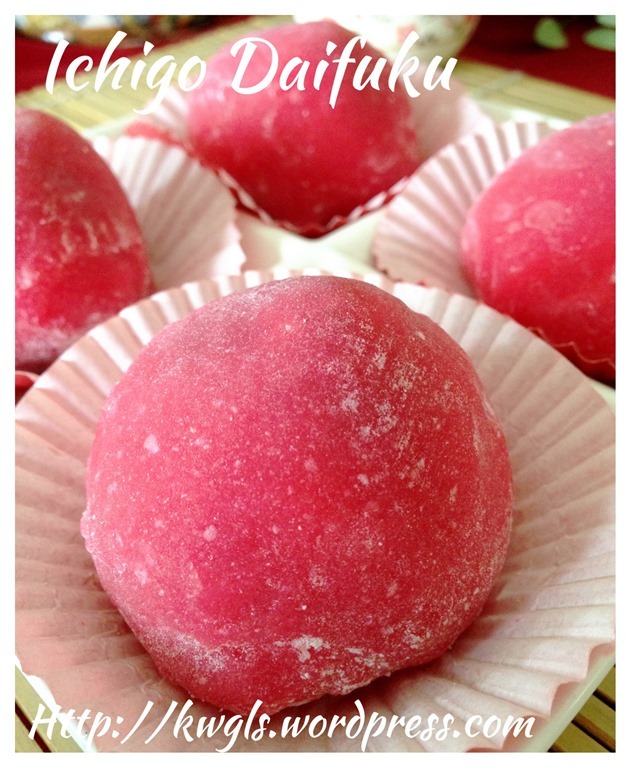 Feel free to add flavour to your mochi such as green tea powder, pandan essence, milo flavour etc.. 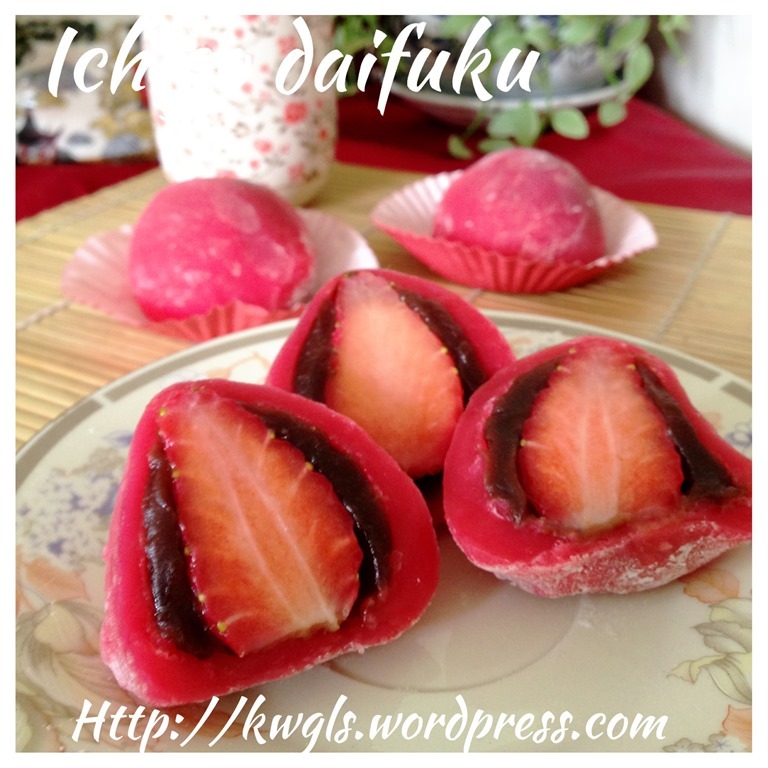 This entry was posted in Chinese and Asian Cakes and Snacks, Food Preparation Series, Party snacks or finger foods, Snacks and tagged いちご大福， 8, 草莓大福, GUAI SHU SHU, Guaishushu, Ichigo Daifuku, Japanese Strawberry Mochi, kenneth goh, Mochi, postaday. Bookmark the permalink.